Epson has announced the Home Cinema 2150 ($899), an upgrade to the Home Cinema 2045, one of their best selling home theater projectors over the last two years. New features include a longer 1.6x zoom lens compared to the 2045's 1.2x, as well as vertical lens shift which the 2045 did not have. So installation flexibility is substantially improved. Brightness is improved to 2500 lumens, and contrast jumps from 35,000:1 to 60,000:1. Also, the Home Cinema 2150 incorporates Miracast for wireless streaming of a variety of sources. Here is a snapshot of how the 2150 and 2045 compare. The Epson Home Cinema 2150 is designed for both dark room home theater and family video entertainment in low to moderate ambient light. Its light weight (7.7 lbs. ), small footprint (12.2" x 11.2"), and upgraded 10-watt speaker make it handy for portable use or backyard movies. For permanent installations, its generous 1.6:1 optical zoom and vertical lens shift allow simple correction of mounting errors. Frame interpolation makes for improved image clarity and reduced motion judder. The 3LCD design eliminates the possibility of rainbow artifacts which often appear on DLP-based projectors. Two HDMI inputs, one of which is MHL-compatible, provide connectivity to a wide range of fixed and mobile devices. Built-in Miracast enables wireless streaming of full HD video from a variety of sources, and MHL capability simplifies mirroring of phones and tablets. The 2-year product warranty is better than many, especially in home theater projectors below $1,000. As an additional bonus the warranty includes Epson's Private Line technical support as well as its Extra Care Home Service 2-business-day exchange. 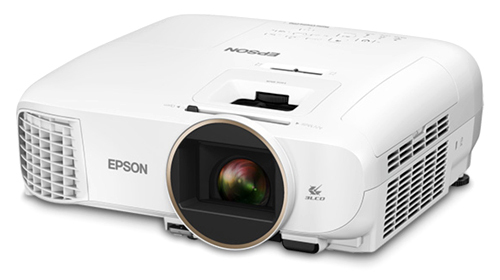 The Home Cinema 2045 was released two years ago and has been one of the hottest selling models in Epson's line. The Home Cinema 2150 is a welcome upgrade, and should help Epson maintain or increase its market share in the sub-$1,000 home theater projector market.